The U.S. wastes more food than any other country. Over half of edible food goes to waste…it is soooo ez to change the game, costs only time and effort to organize…so why aren’t more doing it??? Ahmad started experimenting with ways that technology could help redistribute uneaten food to those who need it. Her first project was Feeding Forward, a local partnership with UC Berkeley’s cafeteria. It grew into Copia, a food redistribution app that has given away an estimated 600,000 pounds of food to 720,000 people in the Bay Area. During the Super Bowl, Copia organized numerous pickups from events and parties that fed over 41,000 people with food that otherwise would have gone to waste. 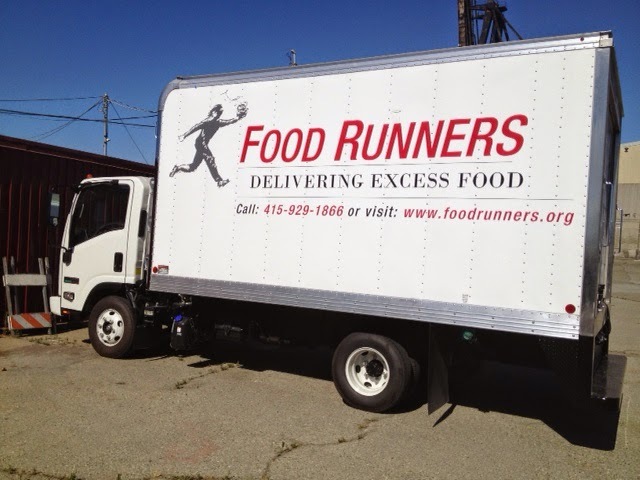 Food Runners allows businesses to donate food to charities in San Francisco. Two things that define today’s San Francisco — bicycling and tech companies — are helping a 27-year-old nonprofit keep some of the city’s less fortunate from going hungry. Mary Risley, founder of a local cooking school, founded Food Runners in 1987 to pick up uneaten food from local businesses in order to distribute it to charities feeding the hungry. In turn those struggling with the city’s rising rents can get by while less food waste ends up in landfill. Risley’s organization has become busier the past year, in part because of the tech companies in the city’s SOMA neighborhood with their cafeterias cooking more food than their employees can eat. Economics and the surging cost of living also play a role: As a recent San Francisco Chronicle article noted, the amount of food donations Food Runners has picked up has spiked 50 percent in the past year. But not only Silicon Valley-type companies are donating to the nonprofit. Grocery stores, including the local Whole Foods and Faletti, also donate to Food Runners. Local bakeries do the same, along with restaurants including COCO500, Kokkari and Piperade. Food Runners also includes wholesalers, farmers markets, hospitals and photographers among its regular donors. What is most impressive about Food Donors is that Risley accomplishes the deliveries, logistics and relationships with various charities on a skeleton staff and shoestring budget. A volunteer arranges food pickups and drop-offs and a truck driver who hauls the larger loads. And another volunteer bicycle courier plies the streets of SOMA to transfer the unwanted food from the likes of Twitter and Google to those who could really use it.